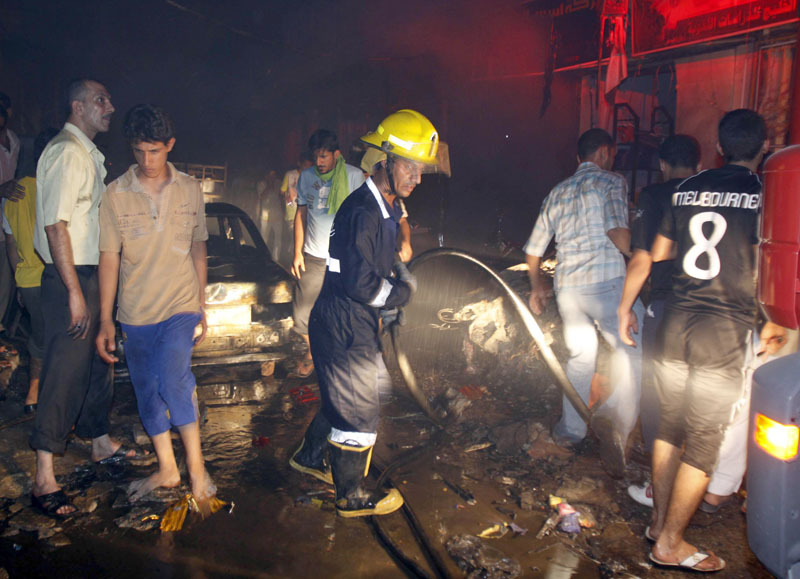 BAGHDAD – An evening explosion killed at least 10 people on Saturday and wounded 35 in a downtown market in Iraq’s second-largest city, officials said. Two police officials said twin blasts in the southern city of Basra came within minutes of each other at the al-Ashaar market. The blasts were caused by a roadside bomb and a car packed with explosives, they said. However, Basra police chief Adil Daham insisted the explosions were caused by a malfunctioning power generator. Such differences are common in the immediate chaotic aftermath of explosions in Iraq. A health official confirmed the casualties that was matched by an Associated Press count of bodies rushed to three different hospitals in Basra, 340 miles (550 kilometers) southeast of Baghdad. Television footage showed bloodied bodies being loaded into ambulances amid a hysterical crowd. The explosions came at the end of a violent day that saw the killings of seven policemen around Iraq – the latest spate of attacks on security forces as all but 50,000 U.S. military troops head home by the end of the month. In the most dramatic strike, gunmen killed five policemen in an overnight shootout that lasted until dawn at a suspected bomb workshop in western Baghdad, security officials said. Violence has dipped dramatically in Iraq, but shootouts and bombings are still common. Attacks on Iraqi security forces have stepped up in recent months as all but 50,000 U.S. military troops head home by the end of the month.